Running an android app on computers has always been an urgent need for us since the day Android got popularity. 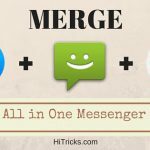 Ever wanted to get the same experience of an android app that you get on your phone, on your pc too? How to play Temple Run on Windows? How to run MX Player on Computer? I don’t own an android device yet, and I am not getting sufficient sum of money to buy a good Android Device. Is there any alternative to try out android? Can I install any android app on my computer? But thanks to Android Emulators, it is now possible to not only install and run android apps on windows, but also have the same environment as android and also control as a virtual device. One of the most popular android emulators we use is Bluestacks, which is by far the best and easily customizable android emulator. But the problem with Bluestacks is that it is not free, Bluestacks will ask you to buy the software of download some free apps to continue using the software. So, here we bring you the latest version of Bluestacks which is modded version and will never ask you to buy the software. Along with that we are also sharing Bluestacks Tweaker, a small and handy software to easily customize different features of Bluestacks and also give you access to a lot of hidden features of Bluestacks. So why wait? 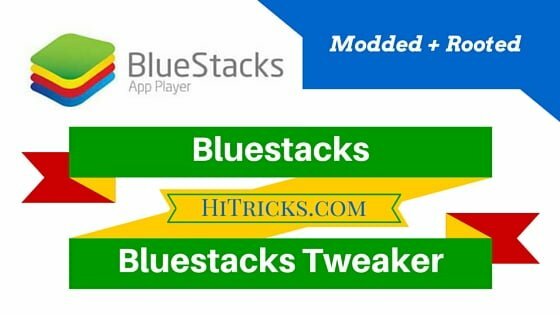 Try out the Bluestacks and Bluestacks Tweaker Now, and enjoy android on windows. Attention: There is an amazing Good News for you! Bluestacks 2 has been released and we have published it’s modded exe file. You can Download Bluestacks v2.0 by clicking here. Download and Run the .exe file. It will install like any other general software. Choose installation location. After it gets installed it will initialize. Then you can start using Bluestacks. You can even get access to Google Play and download any android apps of your choice. Not only this, you can even run any 3rd party apk file that you download from the web. Just click on the apk file to run it via Bluestacks. 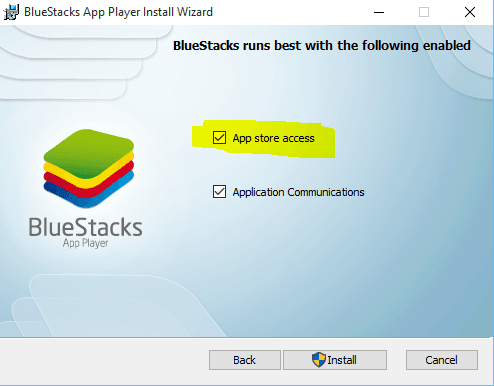 Important Note: While installing Bluestacks, it will ask you whether you want App Store Access Enabled. Always Choose that option to get access to Google Play Store. Download and run the .exe file as administrator. Right click on the .exe file and click on Run as Administrator to start it with full administrator privilages. This is important to enjoy all benefits of Bluestacks Tweaker. 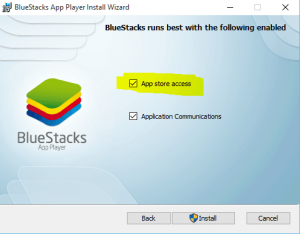 Bluestacks Tweaker automatically detects your bluestacks location and starts to act on it. You get lots of admin customizations such as change Android Id, Change Guid, Change Google Advertising Id, Change IMEI, Change Model No of the virtual device, Size and RAM, create and delete partitions etc. 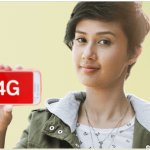 So, this tool can help you change Android Id, IMEI etc and make your device untraceable. 1. Is this version of Bluestacks rooted? Ans: Yes. This version is pre-rooted. You don’t have to do anything to get root access. 2. How to check if I have Root Access? 3. The language is different. How can I change it to English? Ans: Go to Language Settings and change it to English, then restart Bluestacks once. Your language will change. What are the popular Android Emulators except Bluestacks? Search Google to find them. But, keep in mind, that these other emulators, though can be rooted, does not come with instant 1 click change Android Id, Imei etc options like Bluestacks Tweaker has, and can be often very much challenging to perform those tasks. However, you can use them to run android apps like usual. Hope you liked it, now it’s time to enjoy Android Apps on Windows. If this post has helped you, don’t forget to share our post on Facebook, use the share buttons below. If you have any difficulty understanding anything, do comment, and I will try my best to assist you. Keep visiting HiTricks and make us proud. Earn Money: HiTricks is using DailyUploads to store their downloadable files. You can also join DailyUploads to upload your files and earn up to 15$ per 1000 downloads. Click here to join. BS Tweaker Modded Exe doesn’t want to download for me on that site, can you upload it to uploaded.net or something? thanks. how can i get english pattern while typing?? webpage is not available. please upload to some other site.